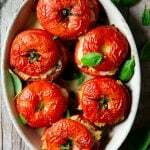 Easy and delicious baked stuffed tomatoes made with creamy orzo and mushroom pasta and chunks of mozzarella cheese. Wash and dry the tomatoes then cut off the tops with a large knife. Do this carefully, not to damage the tops as they'll act as a lid when baking. Put all the pulp into a blender and blend for a few seconds until it's all broken up and has a smooth consistency. Put the blended juice through a sieve to get rid of any seeds (these can make the sauce bitter). Saute minced garlic and 4 salted anchovy fillets to a pan until the anchovies have started to break down and garlic is fragrant. Add the tomato juice with a good pinch of pepper and cook down for 10 minutes. Add salt if needed. Add torn fresh basil and any salt if needed. Add cooked pasta to the sauce and toss to coat, serve.